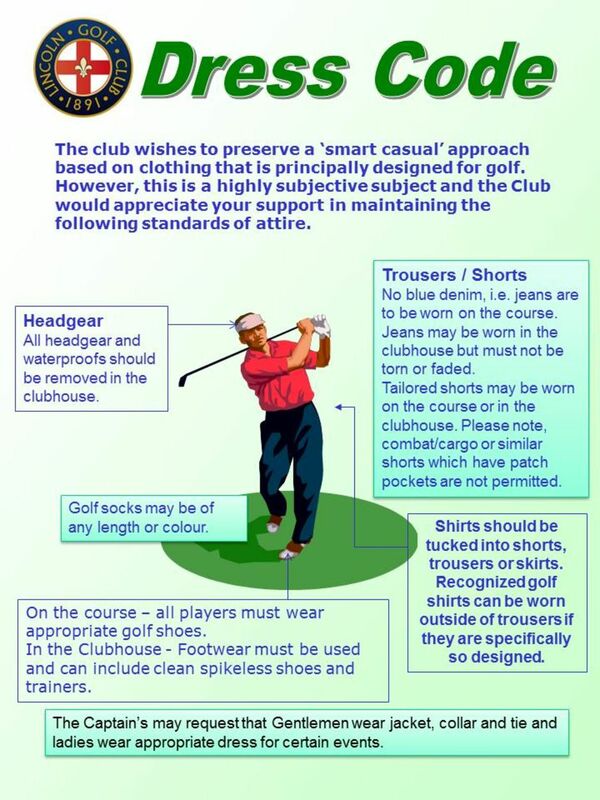 Members, visitors and guests are asked to follow the dress code adopted by the club. All players must wear appropriate golf shoes. Conventional golf wear is required. Shorts should be tailored. Golf socks may be of any length or colour. Blue denim jeans are not permitted. Shirts should be worn inside trousers, shorts or skirts, however recognized golf shirts can be worn outside when they are specifically so designed. N.B. For the purpose of clarity “tailored shorts” does not include combat, cargo or similar shorts which have front or side patch pockets. Smart casual wear, including tailored shorts, may be worn in the clubhouse. Denim jeans are permitted but must not be faded or torn. Footwear must be used and can include clean spikeless shoes and trainers. Headgear and waterproofs are not permitted. The Captains may request that gentlemen wear jacket, collar and tie and ladies wear appropriate dress for certain events. The implementation of the dress code is primarily the responsibility of the Management, staff, committee, and members of Lincoln Golf Club. It is expected that the implementation of this code will be effected with courtesy and common sense, especially as regards guests and visitors. However, those who knowingly disregard the dress code may be asked by a member of staff or committee to leave or refrain from entering certain areas of the Clubhouse.